Here are some snazzy birthday facts about 29th of August 1934 that no one tells you about. Don’t wait a minute longer and jump in using the content links below. Average read time of 9 minutes. Enjoy! What day was my birthday Aug 29, 1934? August 29, 1934 was a Wednesday and it was the 241st day of the year 1934. It was the 35th Wednesday of that year. The next time you can reuse your old 1934 calendar will be in 2029. Both calendars will be exactly the same! This is assuming you are not interested in the dates for Easter and other irregular holidays that are based on a lunisolar calendar. There are 132 days left before your next birthday. You will be 85 years old when that day comes. There have been 30,914 days from the day you were born up to today. If you’ve been sleeping 8 hours daily since birth, then you have slept a total of 10,305 days or 28.21 years. You spent 33% of your life sleeping. Since night and day always follow each other, there were precisely 1,046 full moons after you were born up to this day. How many of them did you see? The next full moon that you can see will be on April 19 at 11:14:00 GMT – Friday. Fun stat: Your first one billion seconds (1,000,000,000) happened sometime on May 7, 1966. If a dog named Ravioli - a Bull Terrier breed, was born on the same date as you then it will be 356 dog years old today. A dog’s first human year is equal to 15 dog years. Dogs age differently depending on breed and size. When you reach the age of 6 Ravioli will be 40 dog years old. From that point forward a small-sized dog like Ravioli will age 4 dog years for every human year. Battle of Montecatini: The army of the Republic of Pisa, commanded by Uguccione della Faggiuola, wins a decisive victory against the joint forces of the Kingdom of Naples and the Republic of Florence despite being outnumbered. The first American Indian reservation is established, at Indian Mills, New Jersey. American Civil War: United States Navy squadron captures forts at Hatteras Inlet, North Carolina. Chicano Moratorium against the Vietnam War, East Los Angeles, California. Police riot kills three people, including journalist Rubén Salazar. What does my birthday August 29, 1934 mean? 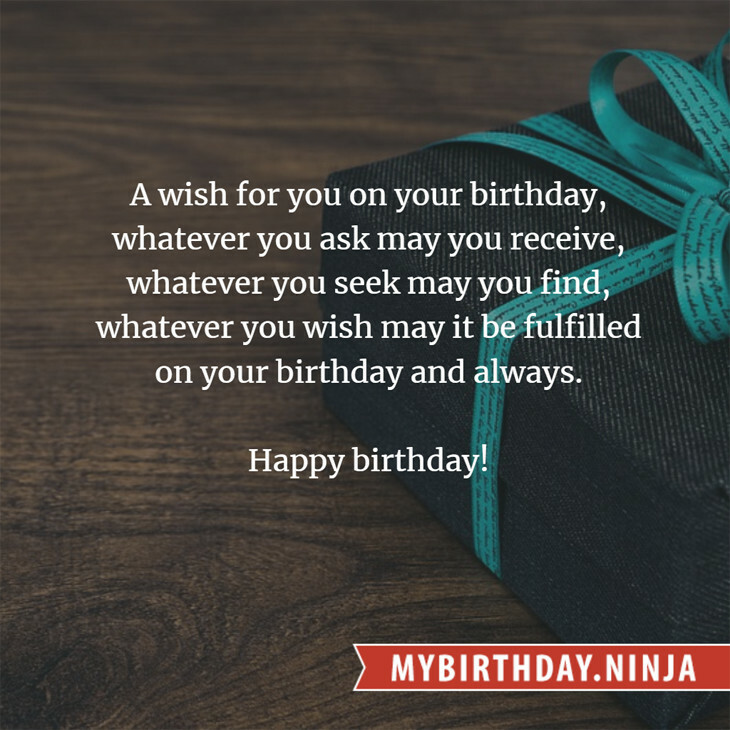 Your birthday numbers 8, 29, and 1934 reveal that your Life Path number is 9. It represents selflessness, forgiveness and creativity. You are the philanthropist, humanitarian, socially conscious, and are deeply concerned about the state of the world. The following celebrities also have the same life path number: Rena Tanaka, Masako Nozawa, Brooke Candy, Bill Murray, Ranveer Singh, Tuğçe Kazaz, Tatyana Shmyga, Martha Wainwright, Emilio Aragón Bermúdez, Lynn Herring. 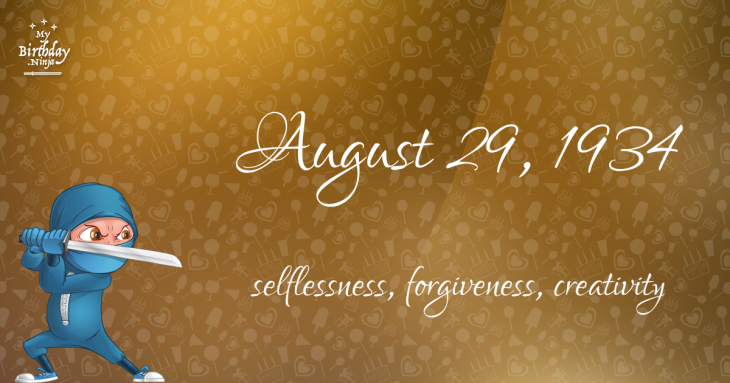 What is the birthday horoscope for Aug 29, 1934? The Western zodiac or sun sign of a person born on August 29 is Virgo ♍ (The Maiden) – a mutable sign with Earth as Western element. The ruling planet is Mercury – the planet of communication. According to the ancient art of Chinese astrology (or Eastern zodiac), Dog is the mythical animal and Wood is the Eastern element of a person born on August 29, 1934. Fun fact: The birth flower for 29th August 1934 is Poppy for preparedness. What is the Love Match for Aug 29, 1934? When it comes to love and relationship, you are most compatible with a person born on April 24, 1905. You have a Love Match compatibility score of +197. Imagine being in love with your soul mate. On the negative side, you are most incompatible with a person born on January 22, 1914. Your incompatibility score is -182. You’ll be like a cat and a dog on a love-hate relationship. Arf-arf, I want to bite you. Meow-meow, stay away from me! What is the popular baby name on 29 Aug 1934? Here’s a quick list of all the fun birthday facts about August 29, 1934. Celebrities, famous birthdays, historical events, and past life were excluded. Try another birth date of someone you know or try the birthday of these celebrities: December 8, 1967 – Junkie XL, Dutch keyboard player and producer; September 7, 1935 – Ronnie Dove, American singer-songwriter; April 19, 1920 – Gene Leis, American guitarist, composer, and producer (d. 1993).